The Seckford Foundation were conspicuous by their absence at a public meeting in Carlton Colville this afternoon organised by the Town Council. You can read my Live Blog of the event. Town Council Chairman Terry Fleet told the meeting of around 60 local residents that they had been invited but had failed even to respond to the invitation. The old Carlton Colville Primary School building has been earmarked by Seckford as the initial temporary location for Beccles Free School until they can move into the Beccles Middle School site in 2014. Terry Fleet went on to to tell the meeting that he had first heard about the Seckford plans from a report on ITV Anglia and that nobody had told him or anyone else in Carlton Colville. Local MP Peter Aldous spoke against the establishment of the free school telling the meeting that he was in favour of free schools but that this was not "the time or the place". He assured sceptical people in the room who described the school as a "done deal" that this wasn't the case and that the DfE would consider it carefully. Campaigner and local teacher Ian Goodyear told the meeting that the failure of Seckford Foundation to attend the meeting showed their lack of concern for the local community. He reported that they regularly failed to respond to correspondence from local residents. 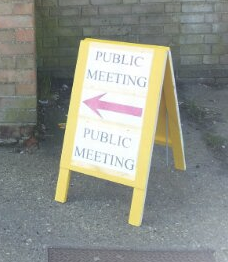 The meeting went on to consider various community uses for the primary school site and after much discussion it was agreed the Town Council would work with the people behind the "Discovery Family Centre" that you can read more about at http://discoveryfamilycentre.org/. Peter Aldous tried to get the various different local councils and groups to agree to work together on this. Whilst there was certainly disagreement about what should be done it was very clear that the free school was not welcomed with the Town Council suggesting it had derailed their plans for the building and others concerned about it not moving out after two years. Some form of community use was clearly favoured by those present and Carlton Colville which now has more than 7000 people and looks to be heading towards 10000 certainly needs more community facilities. As for the Seckford "no show" it is difficult to know how to interpret this. Some have suggested that it might mean they are confident the school is going ahead regardless but the opposite interpretation is just as possible. We just won't know until there is a decision.